Summary: In order to further improve the comprehensive quality of cadres, enhance the comprehensive management ability, innovation ability and execution ability, at the same time to evaluate and assess the effect of the first training class, recently, the 2017 China Transport Group Senior Management Cadres And The First Phase Effect Evaluation Training Courses which organized by the Jining City Industrial and Information Commercial Vocational Training School was held in Shandong Coal Group Industrial Park e-commerce technology industry building on the second floor conference room. 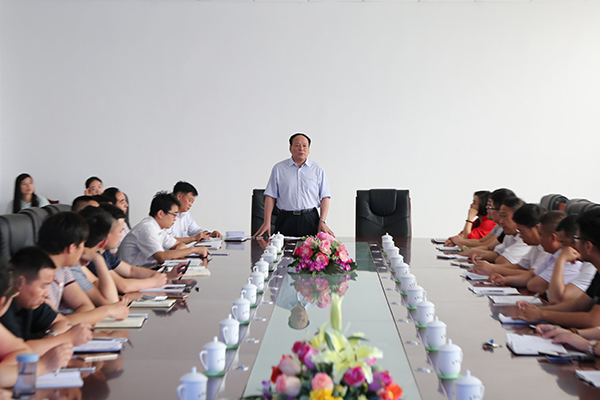 Shandong Coal Group Chairman and General Manager Qu Qing personally attended and made speech, more than 40 people including the leadership team members, leading cadres above middle level of branch companies, functional departments of China Transport Group attended the training. In order to further improve the comprehensive quality of cadres, enhance the comprehensive management ability, innovation ability and execution ability, at the same time to evaluate and assess the effect of the first training class, recently, the 2017 China Transport Group Senior Management Cadres And The First Phase Effect Evaluation Training Courses which organized by the Jining City Industrial and Information Commercial Vocational Training School was held in Shandong Coal Group Industrial Park e-commerce technology industry building on the second floor conference room. 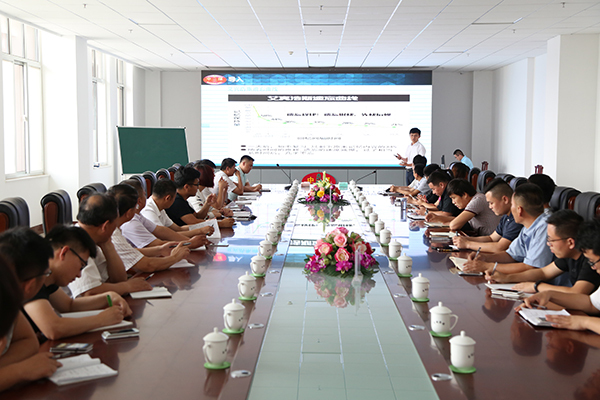 Shandong Coal Group Chairman and General Manager Qu Qing personally attended and made speech, more than 40 people including the leadership team members, leading cadres above middle level of branch companies, functional departments of China Transport Group attended the training. This course mainly reviews the main contents of the first training, namely, the manager's responsibility, execution and business etiquette. At the same time, it evaluates the actual effect of the first training, and combines with the company's international trade, e-commerce and practical cases of financial management. Analysis and solve the company's business problems. Training class, the use of lecturers role swaps, students took to the podium and other forms of interaction on the previous training content, training effectiveness assessment, through the students in person demonstration, from passive to active speech, so that everyone In the relaxed atmosphere to further clarify the purpose and significance of the training, the participants through the guide of instructor Combine the actual work to discuss and summarize, deepen the understanding of the training content and memory. After the training, the students have said that we should learn the knowledge and work of the actual combination of limited knowledge to give an infinite amplification, in their own management positions to play a greater advantage to enhance the overall quality and ability, provide more good service for the China Transport Group! Jining Jining City Industrial and Information Commercial Vocational Training School is invested and foundered by the Shandong Coal Group, for the national enrollment, by the Jining City High-tech Zone Labor and Personnel Security Department warded the "People's Republic of private schools school permit", the only one e-commerce personnel training institutions approved by Jining Civil Affairs Bureau,but also the only schools that focus on e-commerce application-oriented personnel training services . At present, the school teaching that use of an area of 10,000 square meters, set up 10 training classrooms, 8 training room, 6 active rooms, multi-functional conference room 5, PC 300, 30 full-time training teachers, each time at the same time Training 300 people, the annual training to reach 2,000 people, mainly set up e-commerce, logistics, international trade, software information, electronic information engineering, business management and other areas of vocational skills training courses. Since the establishment of the school, actively respond to the national advocacy of the Internet + concept, the call of public entrepreneurship and innovation, relying on China Transport Group strong group strength and rich experience in enterprise personnel training, integration of the national e-commerce business more than 300 actual combat mentor, Baidu, Google, Alibaba well-known lecturers and principal of domestic large and medium-sized enterprises to teach students. Excellent assessment of those who have the opportunity to directly enter the Shandong Coal Group or by the school recommend employment to a number of large and medium-sized enterprises, to achieve every outstanding student's high salary! At present, Jining City Industrial and Information Commercial Vocational Training School have been successfully held e-commerce, cross-border e-commerce, corporate cadre management and other training courses, by the community's warm welcome and social response is very good. The next step, we will strictly abide the relevant provisions of the national private vocational training, to strengthen the management of teaching and ensure the quality of training, honest and trustworthy, standardized school, with diversified professional, strong teachers, standard teaching environment, flexible training mode and high quality service of five advantages , Relying on the strong e-commerce comprehensive strength of China Transport Group, The Jining City Industrial and Information Commercial Vocational Training School to build have a set of research, teaching, training, transportation, services and to be one of the largest e-commerce personnel training schools in Shandong Province!